The process involves installing a water distribution network that supplies villages or small towns with water from a spring or high-up expanse of water, such as a river, lake or water retained by a dam, with having to install pumps. The remoteness of water points makes it very difficult to supply populations with drinking water. 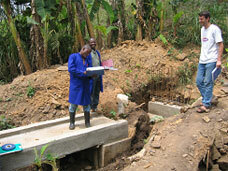 In some places several kilometres must be covered to reach an improved water source. The water therefore has to be conveyed from its start point to the dwellings (individual connections or standpipes). This is achieved by installing a water distribution network that normally comprises a main pipe to which are connected secondary pipes that supply all districts in a village or small town. This is known as a gravity network when the start point is sufficiently higher than the dwellings so that the population is supplied simply by using the slope, with no need to install booster pumps or build a raised reservoir (like a water tower). When local topographic conditions allow, the gravity solution can be ideal for villages and small towns or certain districts in a large town. 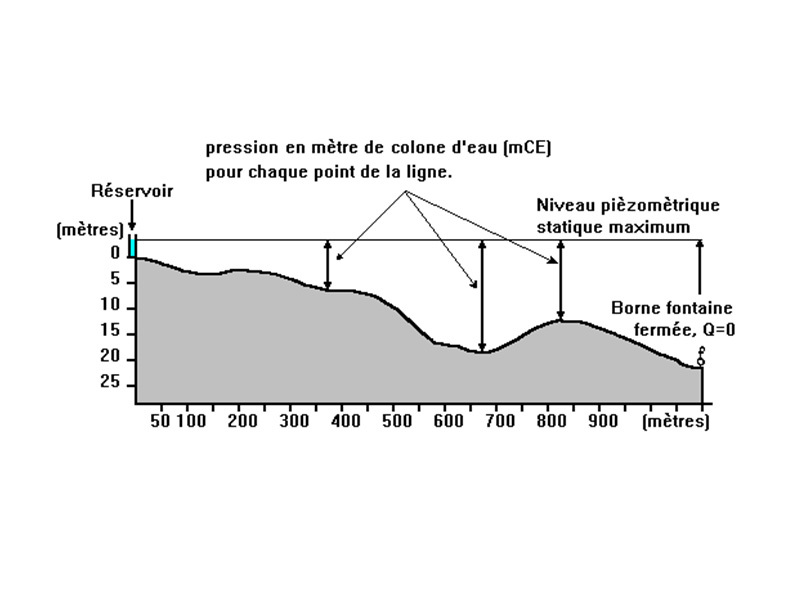 It is difficult to apply it to a whole town for several reasons, such as the differences in altitude between some districts, the height differences between various buildings and the length of pipes required to serve the dwellings the furthest away from the water source, which increases the head loss. 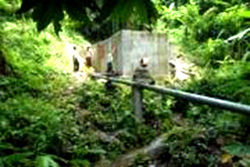 When the water source is outside the village, the water supply and distribution network starts with a main pipe that conveys all the water flow rate from its source to the village. The site topography usually means having to install a pump discharging the water into pipework connecting the network to a raised reservoir which will be positioned at a high spot, if there is one, or in the centre of the village. From there, the water will once again be conveyed by gravity to the dwellings or standpipes. If the water is turbid, the main supply should transit by settling or filtering basins, for example on a sand bed. In the most favourable cases, especially in undulating regions, the water intake is located at a significantly higher altitude than the dwellings and it is possible to take advantage of the available pressure to install a full gravity network without pumping. 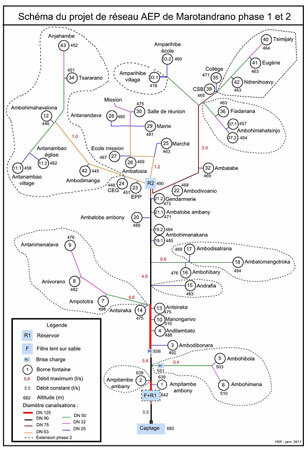 Before starting to study such a network in detail, a preliminary feasibility study is necessary to estimate whether the difference in level between the various network components is enough for the water to flow by gravity. An operator using an altimeter to plot the altitude of characteristic points can estimate this quickly. His readings will then be used to determine the "static" or "dynamic" pressures in the pipes at every point in the network. For gravity distribution, the slope between the high point in the network (reservoir or spring catchment) and the furthest distribution point must be greater than 1%. No part of the network must be above a fall line of 1% plotted from the high point. When both these conditions are met, it is theoretically possible technically to build a gravity distribution system. A detailed study must nevertheless confirm this. Conversely, if, in some places, the pressure is too high, more than 100 m water column (or 10 bar), one or more "baffle blocks" must be built which, depending on the topography, may be placed in the main pipe or at the start of a secondary pipe. In practice, it is recommended not to go more than 60 m to avoid too much load on hydraulic equipment (risk of leaks in the pipe and valve gaskets). - H : difference in level between the high point and the point considered (m). - ΔP : head losses (m). The head losses are caused by the water friction in the pipes and are calculated from the flow rate and speed through the pipes. Formulae and nomograms (see if necessary the ACF document, pages 14 to 23, referred to at the end of the sheet) are then used to determine the head losses based on the length, diameter and material used for each section of piping. To this must be added the singular head losses due to the pipework route (elbow, narrowing, widening, etc.) and the hydraulic equipment (valves, check valves, etc.). The pressure must without fail remain positive throughout the network. 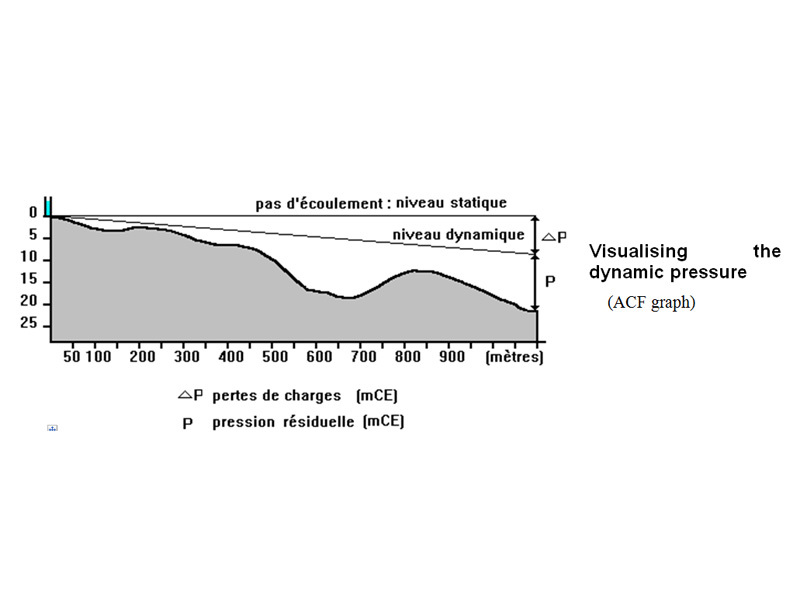 It is recommended that this pressure is greater than 10 m WC (or 1 bar) to avoid risks of pollution. Otherwise, increase the diameter of some pipes and check again. The design of a gravity network becomes complicated if it is extensive and includes many connections. The main difficulty lies therefore in checking that every use point will have sufficient flow rate at any time regardless of the consumption at the other water points. It is also important to make sure that there will be no overpressure which may be too much for the hydraulic equipment (pipes, all types of valves, etc.). 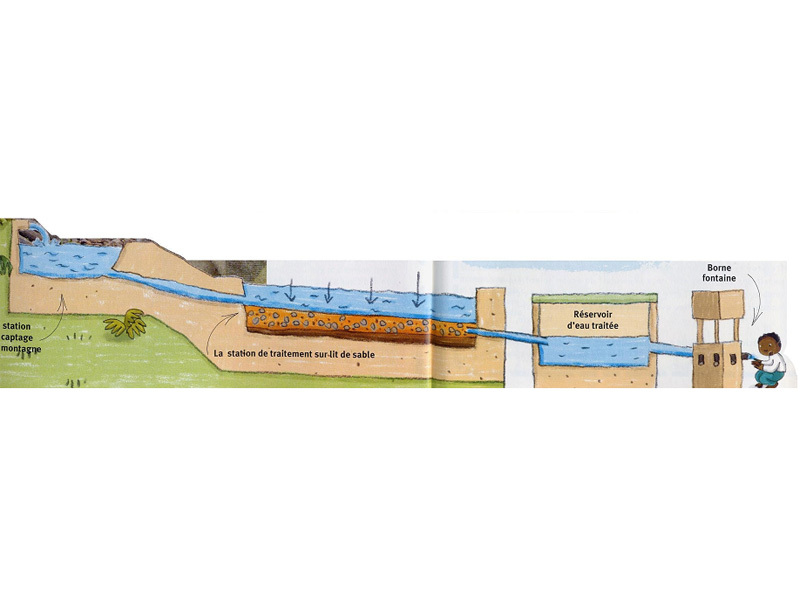 The document opposite from the NGO "Hydraulique sans frontières" gives a sample diagram of a gravity water network. It was designed to supply water to a small town in Madagascar in a rural area with hills nearby. It includes a spring catchment, a simplified sand filtering device, two reservoirs, a baffle block and 42 standpipes spread through the town centre and the various districts. The main advantage of a gravity network is that it can operate in purely hydraulic fashion without pumping. It often means a saving in investment (no purchasing of pumps but sometimes the diameter of certain parts of the network has to be increased), but always a saving in operating expenses linked to the pumping (power, lubricants, spare parts, servicing) and no risk of breakdown that would leave the population without drinking water. The cost of the various installations depends above all on the population to be served (number of inhabitants and also their water consumption), the local topography and the distance from the source or the borehole to the area being supplied. The network must be designed around all these parameters. 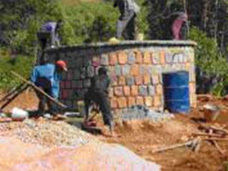 As an example, the Caritas Burundi work under a development programme for 143 sources, rainwater recovery and latrine construction, a 6 km drinking water gravity network equipped with reservoirs, bleed chambers and standpipes cost €47,700. The complete overhaul of three other gravity networks, each an average 12 km long, cost €16,000 on average, hence the importance of regular servicing. The estimation of medium-term needs and therefore of future consumption is the basis for feasibility and design studies of a gravity network. It involves the development projects for the town or village. It is therefore important to involve the local populations at the preliminary project phase. This participation must continue when installing the network to involve the population in its operation and maintenance. In Nord-Kivu province in the Democratic Republic of Congo, the Solidarités association has created a gravity supply programme providing permanent, sustainable drinking water to the entire urban population in the town of Beni (176,000 population in 2002). The engineered structures were built in line with local customs and traditions so that the populations benefiting from the system could subsequently take over and maintain the network. - Develop the responsibility of users in terms of managing and servicing the engineered structure. - ACF (Action contre la faim) has published a highly-detailed and interesting 54-page extract entitled "Gravity distribution network" from its book "Water, sanitation and hygiene for at-risk populations" (744 pages). This gives all the useful technical information illustrated by numerous sketches and examples for the feasibility study, detailed study and the construction of a gravity distribution network. - SOLIDARITES International : Detailed description of a relevant gravity supply project at Beni, a city in Nord-Kivu (RDC) executed by the association, illustrated by numerous diagrams and photos.